A few days ago, while I was working here in my kitchen on the second or third day of a new diet – read diet as a slightly controlled food habit to get rid of the Christmas feast – I had a sudden urge, a strong desire, a physical need to stick my fork into a slice of chocolate cake, an obscenely layered, moist, intense, black chocolate cake. I was torn, as you can imagine. Then I realized that I deserved it, yes, I deserved a chocolate cake. I am facing a new challenge: in February I will teach an Interpersonal Communication course in Florence at the Florence University Of the Arts. I am flattered, honoured, excited, scared to death. I feel again as ten years ago, when I was at the university, with books, notebooks, abstracts and summaries of the summaries, because I am the most serious graphomaniac you have met, if I do not write I do not memorize. At the same time I’m also trying to arrange my work for the next months, the first requests for the new season cooking classes have begun to pop into my mailbox and there are other long-term projects on the horizon. You see, I totally deserved that chocolate cake. When it comes to chocolate cakes, though, you are on a slippery ground. 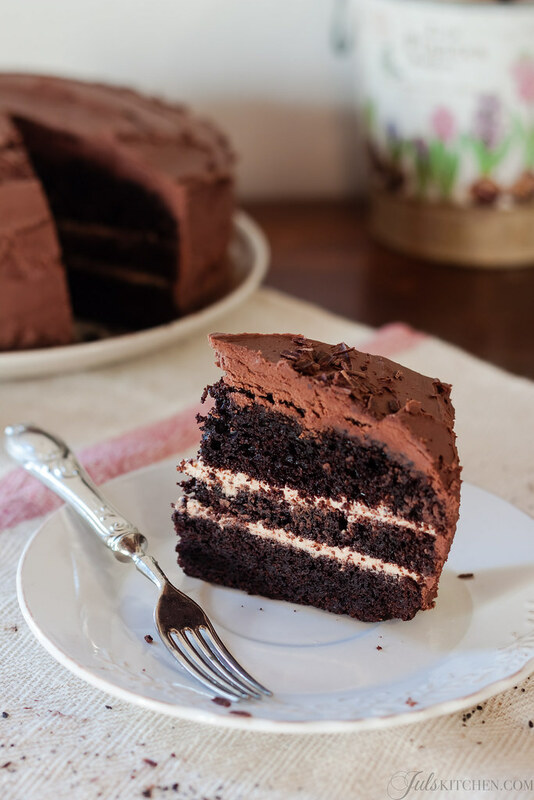 Often chocolate cakes are boring and dry, or on the opposite, they reach the excesses, they are too sweet and complex, you lose the intense pleasure of chocolate. Fresh crusty bread and crisp dark chocolate are a perfect combination, for example. 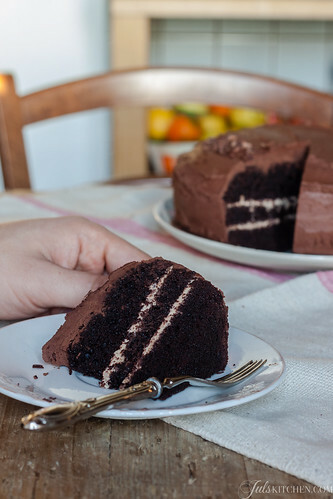 I wanted a chocolate cake that was exactly as I had imagined, I could see the white thin layers of a creamy filling in between the thick layers of the cake, and these had to be moist, black and intense. And I wanted a hint of coffee, too, to quench the sweetness. I wanted a spectacular cake, the kind of cake that you would slice keeping your breath, but it was equally important to me to give to my cake a homely rustic feel, because it had to be a cake for the afternoon tea. For the cake follow Citrus and Candy's direction, using cream instead of Baileys. Whip the mascarpone to soften it, then add the ristretto coffee and icing sugar, stir again to mix all the ingredients and keep in refrigerator until ready to complete the cake. Warm the cream on the stove and bring it to the boil, then pour it onto the chopped dark chocolate. Whisk until the chocolate is completely melted. Leave to cool completely, then whip with an electric beater until thick. We can finally assemble the cake! Slice the cake lengthwise into three layers, then spread with the mascarpone and coffee filling. 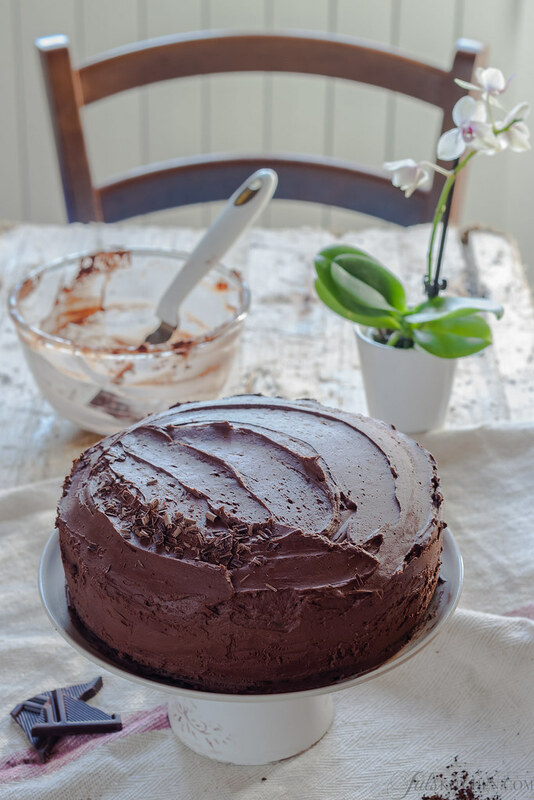 Cover the cake with the whipped cream and chocolate ganache, spreading it with a spatula. I like it rustic, I like to see the signs of the spatula, but with some time and calmness you can make it completely smooth. Sprinkle the cake with a some grated dark chocolate. Let it sit for a few hours before enjoying it. The next day is even better. 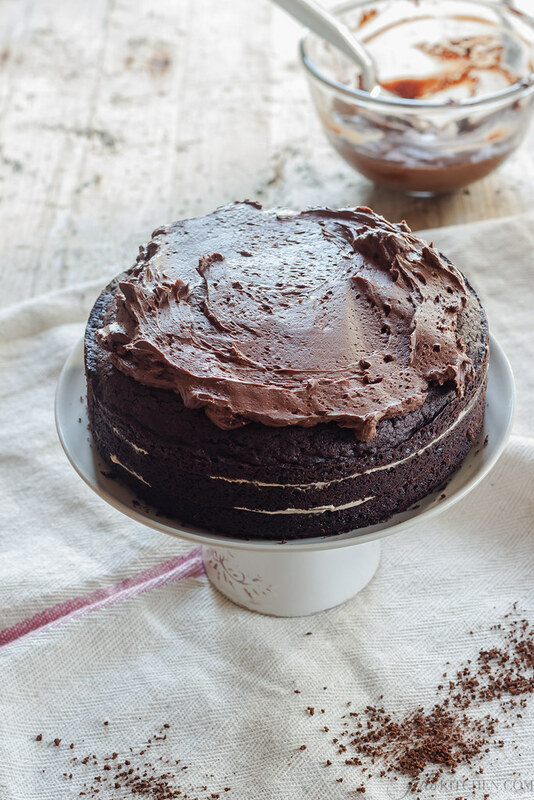 So, yes, hum, chocolate cake. Which is your favourite chocolate cake? 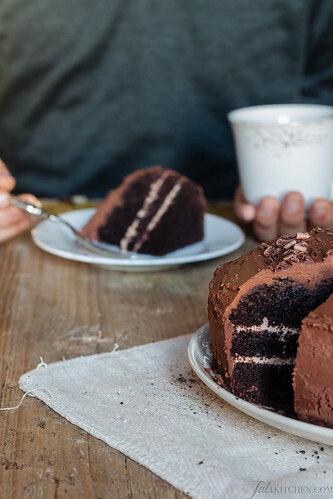 The cake you dream of at your third day of diet, the cake you would enjoy curled up in your sofa in front of a fireplace, the cake you would share (reluctantly) with your loved one? This is still my favourite chocolate cake, I’ve made it several times and every time I’m impressed by its simple winter feel, it’s the olive oil and tangerine chocolate cake. Perfect with the afternoon tea. According to Emiko, this is THE chocolate cake, Elizabeth David’s chocolate cake. Simple, with a strong personality, just as the famous food writer, and naturally gluten free. A must in every foodie’s chocolate archive. One should never have to justify a chocolate cake!! It is always acceptable to want a slice every day, any time of the day!! :)) This one looks lovely! All the best on the new assignment! happiness is having one all to myself LOL.